The Japanese kimono has been a traditional garment worn by many in Japan for centuries and still holds remarkable symbolic and historical significance in the 21st century. 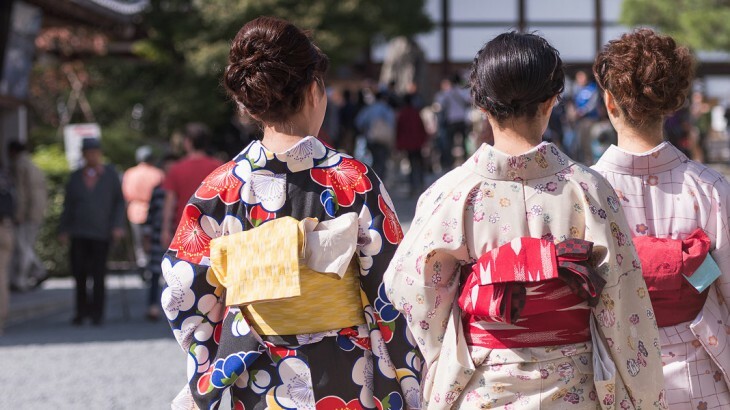 Here we look through the history and significance of the Japanese kimono and how it has become a point of interest, especially with those seeking culture through detailed tours of Japan. During the 8th century, the earliest forms of the kimono were influenced by the traditional Han Chinese clothing, known today in Japan as Hanfu. As Chinese culture frequently influenced Japanese fashion, they soon adopted and adapted their style of clothing, particularly in women’s fashion. The kimono evolved to take on different styles and various substyles, such as the Kosode – a single kimono which was formerly worn as underwear. During the Edo period of 1607 and 1867, multiple changes were applied to the traditional kimono with the addition of longer sleeves, as well as the obi a thick belt securing layers of the kimono and material around the waist. These became more popular amongst unmarried women. Geisha are the world-renowned traditional Japanese female entertainers who are trained in various performing arts and who also act as hostesses, mainly to accommodate the male customers. The kimono has been a longstanding characteristic of the Geisha, along with the white faces, hair ornaments such as flowers and blossoms known as Kanzashi and their beautifully applied make-up. On average it costs £348,000 to train as a Geisha and most of this is spent on Kanzashi, wigs and, most importantly, the Japanese kimono. 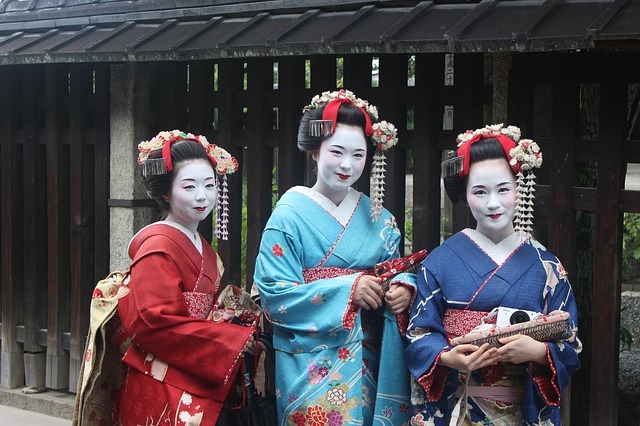 Like other native dress traditions around the world, for the Geisha, the style of the Japanese kimono is dependent on the season, celebration and event that they are attending. 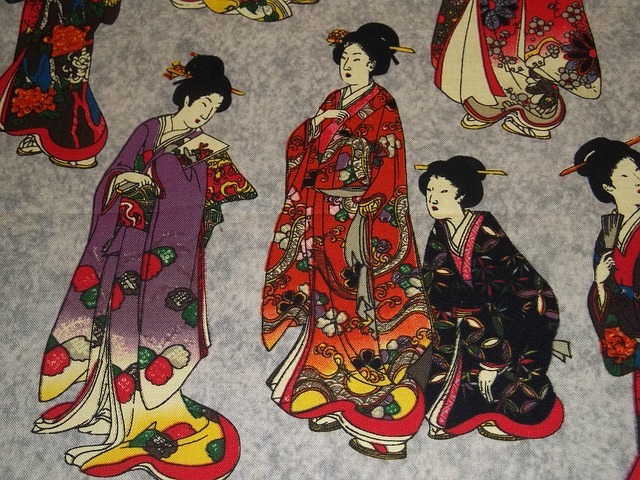 The different colours and embroidery patterns also reflect the seniority of the Geisha herself. A junior’s collar will be predominantly red with silver, gold or white embroidery. As they get to their second and third year of training, this will be embroidered with discreet white detail when seen from the front, then completely white when she is a fully trained Geisha. Each layer of the Japanese kimono represents layers of the country’s history, which has concluded with the kimono design we know today. When the kimono style was born in the eighth century, Heian noblewomen wore twelve layers of kimono to symbolise the seasons and occasions during the peaceful Heian era of 794 – 1192 AD. Jez Willard from The Japanese Shop, which provides quality Japanese gifts, origami and many varieties of the kimono, took influence for his ideas whilst living in Japan. 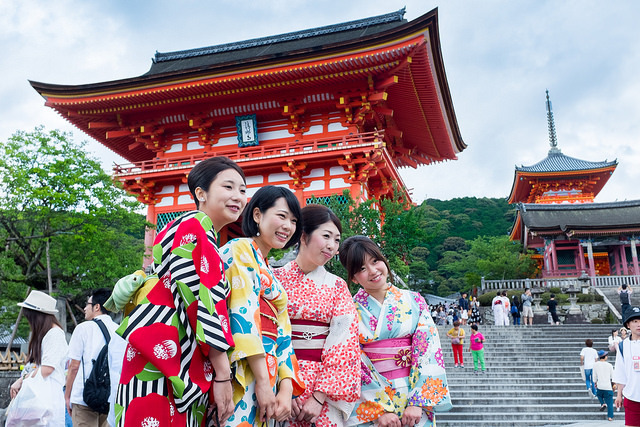 Jez comments: “I remember first seeing ladies wearing brightly coloured kimono on the first of what became many wonderful trips to the beautiful city of Kyoto. When I lived in Japan I became used to seeing them being worn on special occasions or on visiting temples and shrines. The Japanese kimono is a significant part of wedding and tea ceremony formal wear, and sumo wrestlers are required to dress in the traditional clothing whenever they appear in the public eye. All styles are sewn by hand, decorated in different patterns and colours in accordance with the occasion or season, and use a silk, linen and hemp based material. Single, repeated patterns on a kimono are considered to be informal, whilst designs that have been created in a free-style sense are considered the formal choice. Iromuji – Worn by married and unmarried women, this coloured kimono is mainly worn at tea ceremonies and is made from dyed silk. Homongi – Translated to ‘visiting wear’, this piece is often worn by friends of the bride at a wedding, both married and unmarried women. The pattern it is adorned with flows over the shoulders, seams and sleeves. Komon – The Komon is known as the casual kimono and can be worn around the town shopping or in restaurants with a formal obi. Furisode – Colour patterns and designs cover the whole of the Furisode and it is also known for their ‘swinging sleeves’, which measure out to an average of 39 to 42 inches. These are worn by unmarried women for formal occasions. 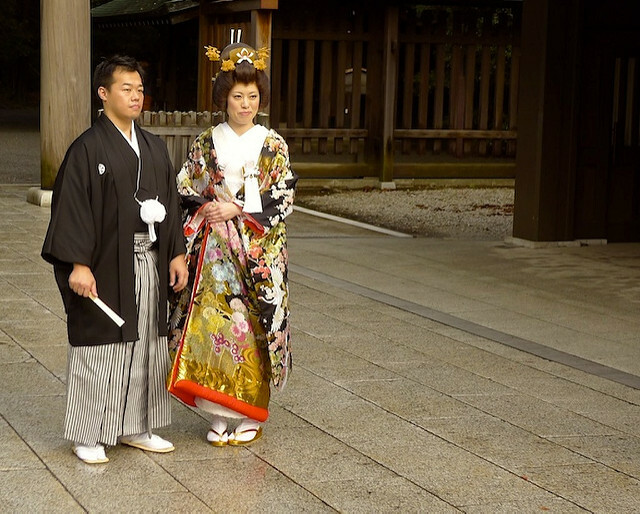 Mofuku – This style is worn by both men and women as the traditional mourning dress. The plain black silk material is layered over white undergarments and all accessories are also black. As well as the significance of each individual style, there are subtle social messages woven into the kimono tradition, particularly for the women. These messages can reflect and hint at their marital status, age and occasion of which they are attending. The kimonos of younger Japanese women, including children, are styled with longer sleeves if they are not married and tend to be more formal and detailed than those worn by older women. 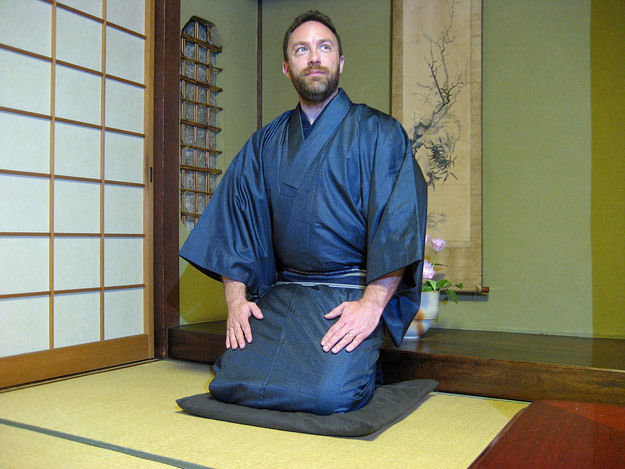 Unlike women, men’s kimonos consist of one basic shape and neutral colours, and the formality is determined by the family crest detailed on the material, also known as the Kamon. Five family crests on one piece of clothing and the use of silk as the base material signifies extreme formality. A cheaper material such as cotton/polyester is considered as a casual approach to kimono wear. 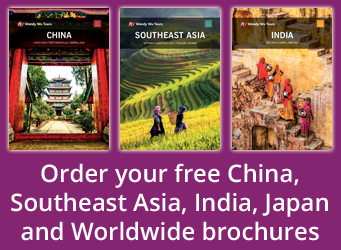 Book an escorted holiday to Japan with Wendy Wu Tours, the UK’s leading Asia Experts. Our award winning escorted, fully inclusive tours visit all the major sights of Japan for an unforgettable holiday.